It’s taken me longer to publish this post than most. I think perhaps because it’s a more difficult topic than my usual cultural observations and fun-time running. It’s also about someone who only recently died, and I’ve always taken a while with paying my respects. I also realized that the longer I waited and the more I read other news and opinion pieces this week, the less I had to add except, perhaps, the European perspective. So I’ve decided to focus on that as well as a handful of personal notes. A few days before Senator John McCain’s family shared the news of his passing, I came across an article in The New Yorker. Being a liberal literature nerd , it was the title that caught my eye: “John McCain and the End of Romantic Conservatism“. Benjamin Wallace-Wells made me aware of McCain’s role in the senate following Trump’s election as well as his cancer diagnosis and his role in the Vietnam War. I know this seems ill-informed, but I was too young to acknowledge McCain as the 2008 Republican nominee in 2008, and I hadn’t really had reason to read up on him since. Even now, despite my interest in POWs due to another observation in my immediate surroundings , I read this article, thought, “hmm, I didn’t expect that,” forwarded the link to my Dad, and didn’t think too much else about it. Less than a week later, the U.S. flags were all at half-mast. The Romantics (and here I mean those involved with the literary and art movement, not the band) celebrated independent spirits and the subjective interpretation of the individual. Wallace-Wells calling McCain a romantic already set the precedent of what to expect: a Lord Byron type figure coming from established nobility but going off to fight for what he thinks is right (at the time, some war of the Greeks) and dying in the process. This is a bit extreme, but McCain did leave behind a void to fill in an extremely partisan Congress that now needs another romantic hero to cross partisan lines and fight for the people, not just the party. however sharp and heartfelt their disputes, however keen their ambitions, they had an obligation to work collaboratively to ensure the Senate discharged its constitutional responsibilities effectively. Our responsibilities are important, vitally important, to the continued success of our Republic. And our arcane rules and customs are deliberately intended to require broad cooperation to function well at all. The most revered members of this institution accepted the necessity of compromise in order to make incremental progress on solving America’s problems and to defend her from her adversaries. Collaboration. Cooperation. Compromise. What has happened to communication and trying to come to agreements in Congress? It’s now big stick ideology without the soft voices. I connected to McCain’s type of heroism in the political arena- without forgetting the military heroism that he is remembered for as well. His willingness to go against the established norms and conventions of the current political positioning and to oppose Trump, and in turn much of the party aligned with the president, would, of course, win me over. And not just me. In the days following the news of his death, McCain was remembered not just by the United States media, but also in European countries like Germany. It’s not often the German news has prepared tributes (you know, the archives of narrated collected video clips about VIPs available for broadcast without too much preparation in the case of death) for more minor (relatively speaking, of course) politicians like US senators. Yesterday, ZDF news reporter Claus Kleber explained some of this interest by comparing a US Senator to a Bundesminister, a member of the federal cabinet. The it’s a bit of a stretch, but I’ll let it pass because McCain was arguably more than just a senator, and I guess if anyone honors romantic heroes, it’s the Germans (in case of doubt, see Schiller). But the tribute made it clear that McCain came on the radar for his stark contrast to Trump as well as the other reasons he’s mourned by the nation. In between news of their own democratic crisis: the rise of neo-nazism and xenophobism in cities like Chemnitz, the German broadcasters delivered the news of McCain’s death as well as his funeral, noting explicitly Trump’s exclusion. However, one should emphasize McCain’s idealism, which meant he would stand up for what he thought was right, even if it meant going against the man holding the highest office, officially his commander-in-chief. McCain’s deepest idealism, which he reserves for NATO and the defense of the West, is not much shared in the Republican Party now, subsumed as it is by Trump and nationalist retrenchment. McCain followed this code of honor to the best of his ability throughout his life, even while in captivity. In fact, when one asked him about his time, McCain would mention his own faults- stealing someone’s washcloth- as much as what the Vietnamese did wrong with POWs, even though McCain would be the only one who would judge him for it. It’s the foundation for the character that made him refuse to be released from the Hanoi POW camp out of the order in which he was captured. This is part of his heroism. But not all would agree. Trump’s logic that being captured is not heroic is based on his incomprehension of what it means to survive the capture or refuse the opportunity to be released earlier- no less, what it even means to be in a position to be captured to begin with- that is, what it means to be willing to lay down one’s life for one country. And yet, surprisingly, Trump’s approval rating continues to remain higher with veterans than with the general public a year after his election. It makes me wonder about the contemporary US voter and what’s important to people. I didn’t intend to bring up the Midterm Elections when I started this post, but McCain’s passing occurred within the same week at the Florida, Arizona and Oklahoma primary elections, and of course the rather solitary Wallace-Well’s article has been joined by a lot more writings. Those who continue to approve of Trump and anything he does think that there’s a lot of “fake mourning” going on for McCain, especially from liberals. This does not surprise me, but it does continue to sadden me. 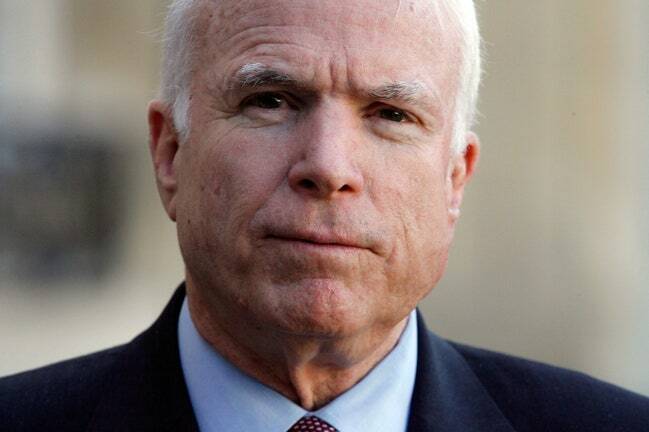 I think anyone who mourns McCain’s passing mourns a man who had character, served his country in every way he could, and did a lot of good for the people of Arizona and the US. While John McCain stood for integrity in leadership and bipartisan politics, Aretha Franklin stood for women’s and African American rights. The funerals of both these people within the past week have provided spaces to openly discuss simmering issues within US society and politics. Why do we wait for these symbolic figures? It only makes sense if we intend to continue the work they began. What are the ways in which we can still do something powerful when Twitter comments overrule one another by the millisecond, when partisanship has ruined communication on Capitol Hill and we have one of the most contested presidents in history? We can vote. It’s not the only thing we can and should do, but it is one thing. With the Midterm Elections and the death of McCain, the vote is out on who can be the romantic hero McCain was. But my primary hope, for now, is to find people to vote for who can play nicely with others- be that Republican, Democrat or other. What have we to lose by trying to work together to find those solutions? We’re not getting much done apart. I don’t think any of us feels very proud of our incapacity. Merely preventing your political opponents from doing what they want isn’t the most inspiring work. There’s greater satisfaction in respecting our differences, but not letting them prevent agreements that don’t require abandonment of core principles, agreements made in good faith that help improve lives and protect the American people. Florida, Arizona and Oklahoma had their first chance to find those willing to try to work together at primaries Tuesday; the midterm General Election is on November 6th. I’ll be in Germany again, but you can bet I’ve got the mail-in ballot ready. really nerdy would be to point out the recognized romantic conservatives in the literary world, the Inklings. These past weeks back in south Florida, I became aware of the National League of Families POW/MIA for the first time when I noticed the flag flying in my neighborhood and along the route I use to get to uni. Turns out, Federal Highway, or United States Route 1 north from Key West, Florida, to the border with the State of Georgia is part of the routes designated with the POW/MIA Memorial Highway Designation Act in 1995 as a POW and MIA Memorial highway. The reminders are fitting. These men and women should not be forgotten. Well, it certainly feels like it’s been at least a year since I last posted, but it’s just been a month and a few weeks. Time is a funny thing. In this time, I turned 26, flew more than 10,000 miles, was invited for a scholarship interview and had that interview. Went from part-time to part-part time work (i.e. 8 hours versus 20). Celebrated Easter with my family. Celebrated my birthday, a friend’s birthday, and my cousin’s birthday. April babies= best babies; no bias there. Basically I lived and celebrated living. First of all, I thought long and hard about why I write. There are a lot of reasons, but in the end, I noticed blog writing is about celebrating ourselves and our productivity as writers. I see a level of egoism in this and a kind of consumerism, but on the other hand, I value the positive things blogging can bring, so I will focus on that. Of these six reasons (too bad it’s six, but I didn’t want to fake a 7th for the sake of a nicer, for me, number), the one thing I learned over the past month(s) is that I don’t need to write for number 4 anymore. I mean, I still have my insecurities and brand of ego to share and fuel, but I don’t really think I have to anymore. Of these six reasons, I plan to whittle the list down the reasons to 2, 5 and 6. In other news, a three month construction project started in my apartment building, which has meant power-drilling at 7 AM and maybe is helping me wake up earlier even if I still have jet lag and need to work on getting to bed earlier as well. My mother broke her second bone in 5 months, got operated on, but is on her way to full recovery, I may finally have financial security to stay in Berlin for at least three years as of the Fall, I am moving forward with my dissertation, barely run more than 10 miles a week and have found my peace with that, and a lot of other things that will slowly become relevant as I post regularly (for me, it’s meant about 2 posts a month) again. I still read a lot of WordPress even if I don’t post myself, but I don’t mind if you tell me one (or three) significant things that has happened since I last posted. How do you deal with in-house construction at what feels like o’dark thirty on a hangover? Do you do mental checks with yourselves to refigure out why you’re doing something? Of course I can’t mention that English speakers tend to mispronounce my name without actually saying how to pronounce it. Sorry about that! The two biggest issues are that English speakers like to pronounce their “th”s and don’t do well with hard “r”s. My name has both, plus four syllables, so I get why it’s an issue. Also, when you look it up on Youtube, you’ll get this: https://www.youtube.com/watch?v=RE2H-ldObAI. It’s not how to pronounce my name, though. doe (a deer, a female deer)-roe-tay-ah! Hope that satisfied some of your curiosity! Thanks for the interest. In other news, this morning, I accidentally stumbled upon the stats for my wanderwolf blog and noticed I had a new “views” record for the blog. I had been staring at the previous record of 56 (or 57?/can’t remember) for about two years and wondered if it would ever be broken. Turns out, it was broken by a number that I’m not too fond of: 69. It may seem immature, but I learned about what the number could reference late in my high school years and found it an awkward number ever since. I skip it on the treadmill in the gym (so no 6.69 paces for me) and I try not to include the use of the number in writing or speech. Unfortunately, I can’t seem to keep it away from me. It was part of my student ID for high school, studying abroad in Hamburg, and my pre-determined pin for several debit cards. Good thing I could change most of those (and the ones I couldn’t change I no longer have, so there). So, while I think it’s really neat my site was viewed so often within a 24 hour period, I hope I don’t have to wait two years to change it again. Also, I’m aware of the irony that I decided to write about my disdain of the number 69, prompting the most I’ve ever used it in my life. Thus concludes personal random facts day two for me. I hope to return to my regularly scheduled programming soon. I’ve been drafting this post in my head for a few days now, walking through a haze of trying to understand why I’m surprised by the election result, and having many conversations with German acquaintances and friends and US friends and family. Needless to say, I did not vote for Trump. However, at the same time, I want to follow through on democracy and recognize him as our president-elect. I’m just not sure about the fine-line between recognizing that someone is bad for a political office and that we should use our democratic powers to do something about it, or someone got into office that I didn’t want and now I just have to learn to deal with it. That’s where this post is coming from. The running joke in my German history classes was that one only ever had to remember one date, and one would know most of the events that affected Germany’s development. …I wish I had a better source to cite, but Wikipedia does the trick most of the time. The article points out the individual significance of each instance and the overall coincidence of the day as a “Day of Fate.” Without November 9th in 1918, we may not have had the November 9th of 1923… or the November 9th of 1989. However, I know this “could have been” game gets boring very quickly, and I’m not going to start playing it. However, I do ask that we don’t have to add November 9th, 2016 to this list. What happened to the Berlin Wall? November 9th in Germany this past Wednesday should have been a day to commemorate the fall of the Berlin Wall. Previous years featured movies in public TV on the 8th about the event and speeches by politicians commemorating the country that was once divided, and is now unified. Instead, election coverage and news reporting occupied the screens and radio waves. You’d think it was the German election being covered. I was surprised at how every single person I observed or met wanted to talk about the election and had his/her opinion to share about what the result would mean for the US, for Germany, how surprising it all was, etc. In light of all this, though, the significance of the day in German history was completely overshadowed. On the other hand, life went on in Germany, and plans made months in advance did not suddenly fall through. This includes the silent, but literally lightening memorial to the Jewish pogroms in Germany in 1939. On the 9th, all through the city, I saw little vases and red candle jars placed in front of the doors of various buildings. It took me a while to realize what these objects were doing in these places, but then I realized that these candles stood in front of houses where small gold bricks inscribed with the names of Jewish citizens were also nestled in between the other bricks of the entryways. These candles were flickering and remembering the lives of those affected by Kristallnacht and its subsequent events. This pogrom is known in English as “Night of the Broken Glass” and on that night, thousands of windows of Jewish shops, homes, and places of worship were smashed. Paramilitary SA troops were free to carry out their rampage on property and persons without interference by authorities, and news of the event spread around the world, equally criticized by all. With the lack of official resistance, it became clear that antisemitism was condoned in Germany. How many citizens not of Jewish heritage woke up that morning and were appalled? How many helped their German-Jewish neighbors sweep up the glass and board their windows? Probably a lot were appalled or shaken by the violence, and a few did help. Still, the regime and the people who participated in the pogrom were allowed to keep their power. And we all know where that led us. This saying may be a quick band-aid on a school child’s hurt feelings, but as cyber bullying and real life shows us, words have destructive effects. They are of course not the same as physical violence, but they can target a person or group and pit them against other people or groups. Then the violence starts if there’s no one with convincing counter-words to calm everyone down again. I’m not saying that batons aimed at windows or people’s noses are the same things as general stereotypical statements about groups of people, but they are dangerously related. Most physical acts come from an attitude fueled by the way people talk about people, places, or situations. When I refer to the dangerous power of words. I’m not ascribing to some idea of political correctness. Political correctness has to do with one or two terms used, where another word could be less offensive. I am talking about strings of words that are connected in a way to show a generally culturally and humanely insensitive attitude. No matter whether people support or reject Trump as president, it is difficult to deny that he forms these kinds of strings. They can be found in sound bites and in transcriptions on paper. This should not be tolerated. I’m not the first person to think this, I’m sure, but I wonder why more people aren’t making the comparison out loud. Why is Trump not, in some ways, similar to Hitler? And why are we afraid to work through this comparison and find out how true or false it really is? I admit, it is probably premature and feeds into the apocalyptic thinking surrounding the whole talk of his being elected, but I don’t think it’s unfounded. Beyond the image we have of the man, filtered through years of half-objective instruction in schools from which we mostly just have shocking images of the result of starvation, mistreatment and hard labor in concentration camps, how many of us know how Hitler’s rise to power started? Or his plan to organize genocide? He didn’t just shoot a Jewish person in the head and that was how he announced his disdain. He also didn’t just jump up on beer table and try to declare an overthrow of government… that was just the first time. The second time, he got into office through an established (even if still young and flawed) democratic process. Hitler represented a “voice of the people,” the masses who felt betrayed by the monarchy in 1918 (the same one that also officially fell on a November 9th), or who suffered through depression and a social system in turmoil. He was charismatic, rejected by some (Western democratic leaders, mostly), embraced by others (hello, Stalin). It started with words… in fact, a whole string of words even before Mein Kampf. These words, even if meant for singular use and to be forgotten or not taken seriously, bring into the semiotic realm feelings that many many actually have, for whatever personal reason, and these words legitimate those feelings as okay to have. This should not be tolerated. The things Trump says should not be tolerated. Being a person who says those things should not be tolerated enough to vote into power. One cannot say that the things Trump says relate to the things expressed in Mein Kampf. I am not saying that the measure of what Trump has expressed equals the measure of what has been expressed by other leaders, even our own US presidents, in the past. However, I am just asking that we don’t let it come to that. What can we expect to happen when racially profiling allows us to see people as a threat before they even step out of a car (oh wait, we already know)? Mexican (and presumably other immigrants) will be considered illegal until proven legal. What happens if those people his actions and words are targeted act decide to resist? Who will enforce his words, and will these enforcement be humane and respectful? Or will the words condone prejudice and inhumanity? Maybe I’m particularly biased by my life work of dealing with language, but I don’t think we should underestimate the power of words. But I’m not sure we can. Since reading the final standing of the electoral votes on Wednesday morning, I finally had to consider the man beyond the words. I looked up his policies and plans, am grateful each time he reverses one plan, and cringe a bit when I hear who he is considering for cabinet. Before Trump was elected, I did not even consider Trump as a possible president, because I could not accept that a man who said the things he said and behaved the way he does, or even just runs his Twitter account the way he does, would be elected. However, he is the president elect of the USA. He became that person a bit when he gave his victory speech on Wednesday. He faded as that person when he posted about the protesters as “professional”s part of a conspiracy, refusing to recognize the democratic enactment of freedom of speech. President Obama and Hillary Clinton both made their moves to allow for the acceptance of this man as president elect, but I cannot be convinced. In the back of my mind are all the things that can go wrong with this situation, and the fact that we’ve seen shadows of this man before, and that November 9th is a fateful day. I hope I don’t have to tell my children about the day that it became known who would be the 45th president of the USA, November 9th, 2016. Finally, Donald Trump, please, do not treat this position and your new job as a new series on The Apprentice. Trump, don’t ever take your power lightly. and I’ve just been nominated for the Sunshine Blogger Award by James from A Tolkienist’s Perspective. Thank you, James! Now, granted, I’ve been spending my time not in Florida, and there hasn’t been too much sun here lately. But I like to think we bloggers are people who give a bit of sun- both positivity and perspective- in each other’s and other readers’ lives. – Thank the person who nominated you in a blog post and link back to their blog. – Answer the 11 questions sent by the person who nominated you. – Nominate 11 new blogs to receive the award and write them 11 new questions. – List the rules and display the Sunshine Blogger Award logo in your post and/or on your blog. So check, check… okay. I love the questions James asked, so here goes. What books on your shelf are begging to be read? Depends on which shelf we’re talking about. I have my “dissertation shelf” and “bed-time reading” shelf. One is above my computer in my desk. The other is in my bed-room. I’ll let you guess which is which. Since both shelves have far too many books I haven’t gotten to yet, but really want to, I’ll name the two I want to get to finish first. One is Wie der Soldat das Grammofon repariert [How the Soldier Repairs the Record-Player] by a German-Bosnian writer Saša Stanišić. The other is Orality and Literacy by Walter Ong. I actually have a blog site devoted entirely to my textual pursuits, in case anyone is interested! 2. How do you motivate yourself to keep the blog up and running? Because things keep happening in my life that I want to share with the world. One can see from the way my blog was a bit neglected while back in the US, that I make many more observations that I think are worth sharing while here in Germany versus back at home. 3. What was the most recent compliment you’ve received and savoured? Being called a real-life-friend by two fellow bloggers. I am someone who has a pretty difficult relationship with virtual realities and social media, so knowing I’ve built a relationship with people through blogging, even if it’s only through words… means a lot to me. 4. What’s your favorite season? Not deciding. Right now. I’m really enjoying Fall. However, in Winter I’ll love winter. Spring makes me happy and summer is amazing. Though summer in Florida is awful. I guess I can decide that. 5. What’s something that amazes you? How all the theories in the world connect and how they all make sense to help make sense of the world, even when they seem like they should be paradoxical. Also, since this needs to be said: How far optimism can bring a person. 6. Do you have a catchphrase? In my head I do: “it’s a bitter-sweet symphony, this life” taken from The Verve song, of course. Also, “why is the rum always gone?” mostly because I never seem to have any in the abode when I’d like some. That’s probably a good thing. 7. What do you like to do on a rainy day? Watch how the rain falls and figure out how to get my run in anyway. Or ignore my laundry. Or read a good book. 8. What’s your all-time favourite town or city? Why? Don’t have one. But I really like Berlin… though that may just be because I’ve crossed an ocean to get here and done a lot of work to be able to stay here. And it’s just pretty cool. But I also believe any space where people have settled and created lives is worth exploring! 9. Where would you like to be in blogging five years from now? Still blogging is the obvious answer. Still have readers is another… a few more readers, maybe. 10. What’s your favorite ice cream flavor? Since I don’t eat ice cream anymore (story for another day), I don’t have a current one. My favorite flavor used to be peppermint with dark chocolate chips. I called it Wicked ice cream. 11. If you could have dinner with anyone from history, who would it be? Right now, it would be Jame Joyce. Nah, it would probably always be James Joyce. But maybe I think I’d be having dinner with Harold Bloom? Actually, I would like dinner with Ralph Ellison. What do you associate the word “sunshine” with? Do you have an analog planner/agenda/calendar? Or is it all on a digital device? Or do you just not have something like this? Do you think you could live abroad for a year in a foreign country where you kind of knew the language, but just barely? I’ve been thinking about this one myself lately. Honestly, I don’t know if I could! Do you set apart a certain time each day for a specific activity? What activity? What motivates you to keep blogging? What is the primary feeling or “thing” that you associate Fall with? Which do you do more: enjoy Sunday evenings or dread Monday mornings? What was the last country you traveled to? If you had all the time and money in the world, what would you do to help “enhance” your blog? Or, alternatively, would you do nothing different? A few weeks ago, I participated in the Berlin elections. Because Berlin is a city-state, this election was the equivalent of a US state election. I had received my voters invitation in the mail back in August. In the meantime, I watched how the city became smothered in campaign posters, each more eye-catching than the last. Every few days, volunteers for the parties would hand out fliers and pens or free cloth shopping bags to lure people into considering their party. Perhaps, because one does a lot more moving around the city in Berlin, one sees a lot more people and posters. It also helps that Germany has a thriving multi-party system. Unlike the US, with its winner-gets-it-all system, Germany’s national and state parliaments are made up proportionally by the number of votes a party gets. There are certain rules, like you have to get more than 5% of the vote to get in- a rule put in place since WWII that may have prevented the Nazis from getting into parliament in 1932. However, the system means that even if you don’t vote for the popular party, your vote isn’t wasted. Unfortunately, that’s how many voters in the US feel, which is why we can’t get out of our stupid Republican/Democrat binary. It’s not all rainbows and unicorns in Germany either. Interestingly, German campaign posters almost always include a representative’s profile picture, as if how the person looks will affect if they are voted for (unfortunately, it kind of does work that way). There’s also a rising right-wing party that can actually get power in this country and white supremacists and nationalists get a voice again in a country where it shouldn’t happen again. In the name of democracy, we are supposed to let them have a voice too… so that’s also an issue. However, the voting process itself was a neat process. Despite all the parties, it’s not as complicated as one imagines. In fact, the ballots are about just as long as in the US. The difference is that one doesn’t ignore everyone beyond the first two lines. Libertarians get considered, conservative nature lovers get considered, socialists exist and get considered… it’s a very diverse ballot for which citizens actually have to prepare themselves and inform themselves. That’s not to say that many people still don’t vote the two largest parties- Christian Democratic and Social Democratic, but these parties rarely get the majority of the vote at the state or national level, and that’s a good thing! So, when I went to vote (and voting happens on Sunday in Germany, giving everyone- even people with 10-hour jobs- the chance to vote! ), I parked my bike outside a historic music school, got in line with the other voters of my district, and pulled out a book. I had a bit of a wait, but soon enough I got to hand over y ID and voting invite for inspection, and then I was in a voting booth with my papers and a pen. I guess I was surprised that the ballots were not electronic, and I didn’t expect that I would be voting for my district representative as well. I was also amused that when voting for the representative, a little note of advice happens below the representative’s name saying: suggested vote: (insert representative’s party name here). I won’t say who or what part(ies) I voted for, but I will say that I was able to vote two different parties at the state and district level and feel good about it. I think that the German systems allows for more representation of all the different values a person can have… and I’m a happy voter in Germany. I can’t really say the same about the upcoming presidential election in the US. Now starts a part of my post where I’m going to add my two cents to the discussion about those up for election in November. For those who have had enough of this, I understand if you don’t want to continue reading. For those mildly curious for what a 25 year old with degrees in literature has to say, I promise I’ve put thought into this post and I’m reasonable, someone who looks for compromise rather than antagonism. Let me start off with a fun fact. I grew up in a bipartisan household. One parent carries a Republican voting card, the other a Democratic one. How does this work, you wonder? How can they have been married for more than 25 years? A lot of it has to do with the ability to find compromise, and that the basic values upheld by both my parents are the same. Conversation doesn’t have to lead to consensus about anything, especially not values; it is enough that it helps people get used to one another. If you’ve been following my blog, you’ve been engaging in conversation with me about Germans and US Americans. I try to share my observations about both countries, often working hard to keep my personal bias and upbringing out of it. I’ve never suggested that one country is the better of the two – such a vast generalization would be absurd, and I can only emphasize how Germans live and love living in the US and vice versa, without having to give up the cultural beliefs or habits they brought with them. So, if the daily life of a person can be satisfactory, despite constant exposure to difference, why can’t we listen more to each other talking about politics? What happened to constructive debate? Yes… of course I set up a segue to last night’s presidential debate, which I found less than satisfactory. Spectators are saying that Clinton won that debate, but only because she as able to keep her cool while Trump was revealed for being the incoherent, ill-prepared, narcissist he’s been for most of the campaign. Maybe this means Trump should not be head of state. Even if he supports the values of most Republicans, he’s not ready for the position. Can you imagine the state dinners with Trump at the head of the table? Do people really think the man knows how to be a diplomat? Money is power, and Trump has money. But he has none of the tact, intelligence, or basic human sympathy that we need in our political leaders. So, that puts the US in an awful position, because while many Republicans of the US can’t vote Hillary Clinton out of principle inspired by their belief in honesty, good character, and following rules, they can’t vote Trump either. Many of these Republicans would also rather see the Republican Party in power, because even if it’s headed by Trump, at least their values will be represented. I understand their wishes for freedom, financial security, and less interference from government in their personal lives. The funny thing is, I also understand the Democrat’s wish for security and less interference from government in their lives. After all, anti-abortion laws are government interference. Health-care and other “socialist” endeavors are endeavors for financial security for citizens of the US- that’s just addressing the obvious. There are many subtle ways in which the goals of all US Americans are the same- upholding basic human rights to life, liberty, and the pursuit of happiness. It’s how we practice these rights that changes. In the end, democrats have to compromise with republicans and republicans with democrats, lobbyists put their hand in the pot, and we end up with pretty much the same measures, regardless of who is the main man or woman in charge. What we can choose, however, is the first representative of our country. Now, I return to the beautiful multiparty system, and ask, why can’t the US get out of its stupid binary? Why is the presidential debate only held between two people? Let’s not forget, there’s the Libertarian Gary Johnson. There will be more than three names on the presidential ballot in November. There’s always the write-in possibility (but, that’s a bit of a misnomer, since the possibility is so small). From here on out, until the election, I’m going to try and leave previous bias against either runner behind, and consider what each of the candidates have to say in response to direct questions about policies, how they will handle national and international security, education and health care reforms, and climate change. I encourage you to do the same with the issues you find important. Just saying. Those were my two cents. I have a few post drafts on standby, waiting to be finished along with the half-dozen other projects I’ve started while waiting for school and a reply to my job applications. However, these have to wait and in the meantime I will reflect on something that I came across today. I don’t live far from Theodor-Heuss Platz. It lies at the end of the Kaiserdamm, an extension of the famous Unter den Linden, Strasse des 17. Junis, and Bismarkstrasse. On a good day, you can stand about where that flame is burning and see the Victory Column and the Brandenburg Gate. Theodor-Heuss Platz used to be called Reichskanzlerplatz, Place of the Reich-Chancellor. From 1933-1945, it was also called Adolf Hitler Platz. Yes, you read that correctly. “Displacement never again” and a flame that was not meant to be put out until Germany was reunited again. Designed by the League of Displaced People, this monument becomes a location of remembrance once a year around the Tag (day) of Heimat. The beauty of this monument is that it stands for the past as well as for the future. It’s a symbol for the German duty to uphold these values for people who are forced to leave their homeland the world over. President* Gauck addressed this duty in his speech yesterday, since Germany is still struggling with the challenges presented by more than a million asylum seekers in the last year. Most Germans didn’t even know this speech was being held. I only found out because I wanted to know why all these wreaths were there. Now that I know, I’m forced to reflect on the destruction of war and the horrible things that happen throughout and because of it. I’m reminded that Germany and the US haven’t had war on their soils in my lifetime or my parent’s lifetimes. We are incredibly lucky. And still, war is happening within the radius of our daily news and tweets and facebook posts. We can be kinder to those people who escape these wars, even if they don’t understand our “culture” or speak our language. Some people deride public displays of remembrance like these, saying they don’t reach anyone and are a waste of resources. I disagree. I always thought the monument was specific for the Jewish and other victims of the Holocaust. I wouldn’t have related Germans as refugee seekers without this public display. I’m sympathetic to the asylum seekers anyway, but I am reminded more firmly that it is my duty to uphold the rights of these people when put in the position to do so, if I believe in these rights. In line with these solemn reminders and thoughts, it was a dreary Sunday in Berlin, but it was still perfect for a little Sunday outing and a lot of desk work. *remember that the German political system is a bit like the British. There’s the representative head of state and the one who actually has power. Chancellor Angela Merkel still has the honor and responsibility of power. Joachim Gauck gets to hold all the important receptions and be all diplomatic.